Aquaculture is one of the fastest developing sector in the world, now accounting for nearly 50 percent of the world’s food fish. As the aquaculture grows, there is increasing aquafeed demand in the market. Thereby aquafeed making business is also the promising industry in the world. In feed pellet production two types of aquafeed processing technology are widely employed in the market: pelleting (mainly produce sinking aquafeeds) and extrusion (can produce sinking or floating extruded aquafeeds). What is extrusion? What is the distinction between extrusion and pelleting? Are pellets better made by extrusion or pelleting? In this article, we will answer these questions according to analyzing the two types of technologies! 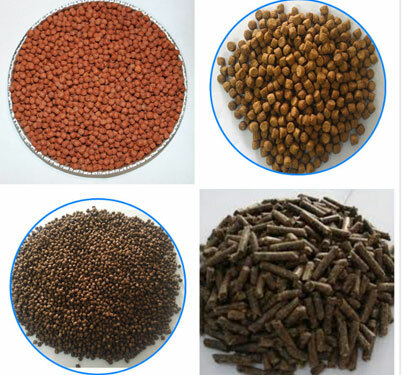 Aquafeed pellet is made of amount of ingredients in various proportion that are pelleted or extruded to the compound diet, which have good shapes, full gelatinization and high level of protein. According to their buoyancy, fish feed can also be divided into sinking, slow sinking and floating aquafeed. Floating aquatic feed is suitable for Tilapia feed, Crucian feed, Ranidae feed, Weever feed etc., and sinking aquatic feed for Siganus Guttatus feed, etc. The nutrient components in fish feed mainly consists of protein, starch (sinking aquafeed consists more than 10% and floating aquafeed consists more than 20%), crude fat, raw fiber, crude ash, vitamin and minerals. Protein provides energy and builds muscles. Vitamins and minerals can enhance natural resistance and feed conversion rate. Starch has great gelatinization under high temperature and high humidity conditions. It can improve the stability of aquafeeds and extrusion density of extruded aquafeeds. It is obvious to see the only difference and here we will introduce the extrusion and pelleting respectively. Extrusion is a high temperature short time (HTST) heating process, it minimizes the degradation of food nutrients while improving the digestibility of protein and starches. Fish feed extruder is an ideal machine that designed for processing floating or sinking aquaticfeed just by adjusting the formula. Extrusion requires higher levels of moisture, heat, and pressure than pelleting. Temperature higher than 100℃ is needed in order to achieve expansion of the feed as it leaves the die. Extrusion consists of wet extrusion and dry extrusion. The high temperature in dry extrusion is acquired through dissipation of mechanical energy from heated surfaces such as barrel and screw surface, or generated by shear forces between wall and material and screw and material. For wet extrusion, the temperature is achieved through preconditioning and steam injection. At the same time the material also undergoes relatively high pressure. The pressure difference in the interior of extruder and the external environment will cause the extrusion of the aquatic feed. As the material is squeezed through die holes at the end of the extruder barrel, part of the water in the superheated dough immediately vaporizes and causes expansion. The popular machines for pellet extrusion are wet type fish feed extruders and dry type fish feed extruders. Pelleting is the process to compress small particles into larger solid with a given shape and texture, which involves the combination of moisture, heat and pressure. These larger homogenous particles agglomerating from small ingredients are also called dense pellets that sink rapidly in water. The ring die aquatic feed pellet mill is the professional pelleting machine for pelleted aquafeed making. The main factors affecting pelleting are ingredients characteristics, moisturizing or steaming before pelleting, die thickness and binders ect. ♦ Pelleted feed quality generally influence by the quantity of fat, fiber and starch in the formula. Some ingredients, due to chemical or physical properties, will lower the pellet resistance to crumbling and water stability. ♦ Additives that primarily treated as pelleting aids are frequently used in fish feed formulas to reduce fines and improve water stability. ♦ In pelleting process, steam can be added into ingredients for starch gelatinization, which is conductive to ingredients binding. Generally, an amount of steam is added to the mash to increase its moisture content to approximately 16% and temperature to about 85 ℃ before passing through the pellet die. From the above, we can see that extrusion is characterized by higher levels of moisture, heat, and pressure than pelleting. Usually, the mixture of finely ground ingredients is conditioned with steam or water and may be precooked before entering the extruder. Therefore extruded feeds are more firmly bound due to the almost complete gelatinization of the starch and result in less fines than pellets. From the above chart, pelleted fish feed, the sinking pellets, are prone to leaching of nutrients into water due to poor stability and disintegration of feed to the bottom waters at feeding. This has been shown to lead to significant quantified losses in aquaculture input management. Pellets made by extrusion are more resistant to disintegration in water than that of pelleting. There are three types of pellets produced by extrusion: fast-sinking, slow sinking and floating form that is available in all water layers to make a rapid and uniform growth of fish. Moreover, a floating feed allows fish farmers to observe the condition of the fish and the amount of food consumed. 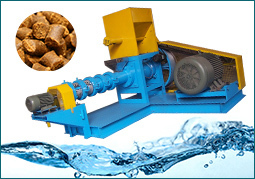 Different shapes and sizes of aquatic feed can be produced by extrusion technology. Extrusion with steam preconditioning is known as wet extrusion and extrusion without steam preconditioning is called dry extrusion. Preconditioning is a very important part of the wet extrusion process for steam or water injection into either the conditioner and or the extruder barrel. The heart of the extruder machine working is: preconditioning, cooking and die shaping. High temperature and high pressure process can kill the salmonellosis and bacterial infections and also makes the pellets easily to digest. 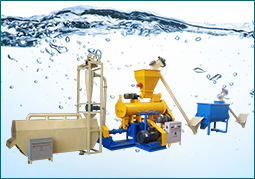 Wet extruder is usually employed for high quality pellet production in large scale! Without utilizing preconditioning, dry extrusion employs lower moisture levels. Therefore it is suitable for processing low moisture and high fat feed material in small and medium sized production. 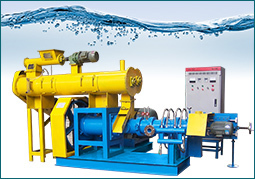 Dry type extruder or wet type extruder are often equipped with one screw or twin-screw. Twin-screw is two screws of equal length placed inside the same barrel. Extruder with twin screw develops on the basis of single screw extrusion machine, which is more complicated than single screw extruder. Moreover, the price and maintenance of twin screw extruders are higher than single screw ones. 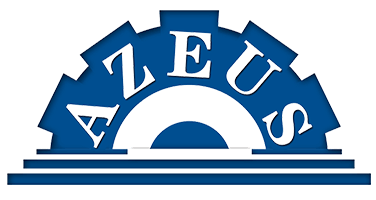 Hot fish feed extruders offered by Azeus are dry type fish feed extruder and wet type fish feed extruder, which are both single screw extruders, which are easy to operate and minimal training is required for the operators.